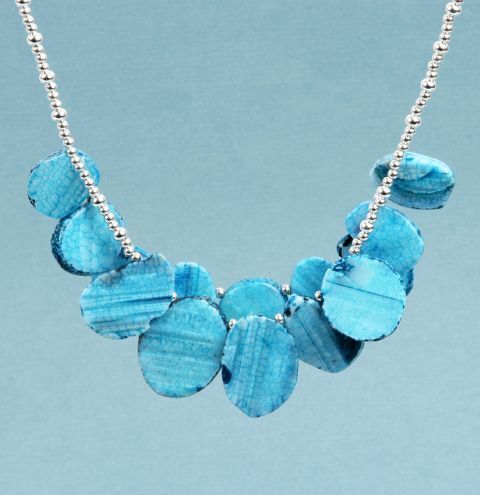 Make a statement gemstone necklace with colourful agate petal beads. Cut a length of the wire in your findings kit measuring approx. 1 metre. Thread a crimp bead to the centre point of the wire and fold the wire in half at this point. Thread a calotte over the two ends of the thread and bring it up to meet the crimp bead. Crush the crimp bead and close the calotte over it to secure it in place. This is one end of your necklace. Use both of your strands as one strand. Thread on your 3mm silver beads and your 4mm silver beads alternately until you have covered approx 7" of wire. Take one of your threads and string on 9 agate petal beads with 3mm silver beads inbetween each one. Spend some time organising the order in which you want to add them. Take your second thread and add 1.25 inch worth of 3mm and 4mm silver beads. Next add 5 agate petal beads and 3mm silver beads alternately to create another layer. This will hang slightly lower than the first layer of agate beads. Finish this by replicating the 1.25 inch of silver beads after adding your agate beads. Bring your two threads together again and add another 7 inches of silver round beads to mirror the other side of the necklace. Thread both threads through a calotte and a crimp bead. Thread back down through the calotte and pull your threads through 3 or more inches of your beadwork to hide the ends. Pull these threads tightly to close up any gaps along your work. You will be able to do this easily if you leave a loop of thread near the crimp bead then finally pull this loop closed by pulling the tail threads. Crush the crimp bead and close the calotte over it. Trim the tail threads so that they're hidden in the design. Finally, securely loop the end hook of the calotte using round nose pliers. Do this on each end of the necklace. Add a jumpring onto one end and a lobster clasp onto the other.